Cypress Cove Marina & Cabins located on Fort Gibson Lake is ideal for a weekend getaway or fishing trip. There are four cabins with two queen size beds that can accommodate up to four people and one cabin with one queen size bed for two. Each cabin also comes with a small kitchen, a full bathroom, window air conditioning units, and heat. Bed linens are provided, but guests are encouraged to bring their own bathroom and kitchen cloths and towels. The kitchen includes a refrigerator and freezer, stove and oven, coffee pot, toaster, and place settings for four people as well as a few pots and pans. The cabins’ covered porches and grills are perfect for an afternoon barbecue or cooking the spoils of a long day of fishing in the evening. The Cypress Cove Marina also has nearly 50 covered and uncovered boat slips available for rental and a variety of supplies for sale including bait and tackle, fuel, camping supplies, boat oil, and other accessories. Guests are also welcome to use the indoor fishing facility. If you don’t want to cook in your cabin or on the grill, try out the restaurant located conveniently on the marina. 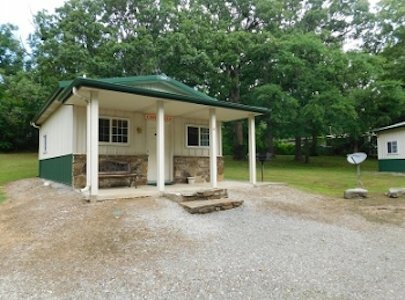 The cabins are near Sequoyah Bay State Park and guest with RVs are welcome and can be accommodated with full hook ups. Open seven days a week during the summer from Memorial Day to Labor Day. From Wagoner intersection of Hwy 69 & Hwy 51, go S on Hwy 69. Turn E on 15th St. When the road ends at a T, go S on Hwy 16 about 5 miles. Go E on 100th St N for about 5 miles. The road ends in the park.